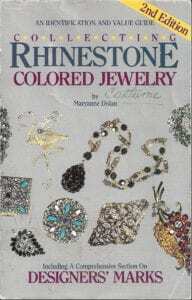 This book “Collecting Rhinestone & Colored Stone Jewelry” by Maryanne Dolan is in its third edition and is clearly a required text for those interested in buying, selling and evaluating rhinestone jewelry. The Rhinestone Jewelry market has grown over the past few years as anyone who goes into antique shops knows. What you might not be aware of is that many of those ‘junk jewelry’ pieces command prices between two and three hundred dollars and some of them are worth thousands. This book explains the field for a neophyte and looks to be an indispensable resource for those already involved with it. It was interesting to get a sense of the scene and the seriousness with which pieces are avidly collected, traded and valued. Chapters address definitions, history, manufacturers, designers, the making methods, care and keeping, trademarks, photos, descriptions, values and finally seventeen chapters on jewelry by object type (‘Bracelets’ for example). These descriptions include a photo, comments, dating and current value ranges for the piece. There are between four and seven pieces per page in this section. At three hundred and eighteen pages the book packs an enormous amount of reference information on the field. The trademarks section alone is about a hundred and fifty pages with about fourteen trademark pictures per page, comments and a paragraph about the company concerned and the marks first date of use. While the section on designers is short it sums up much of the pertinent information about famous names to watch for and comments on the current valuation for a particular name’s worth. An example is ‘Mosell as a signature on jewelry is really climbing to the top of the charts’. A soft cover book in an 8″ and a half by 11″ format, it has hundreds of black and white photos and 24 color photographs. The color photos are fairly good but the black and white ones vary considerably in quality and tend to be quite contrasty. The book is however concerned primarily with documentation and so for those using the photo only to identify a given piece for a valuation the photographs will serve. The cover is attractive. The material qualities are not extremely high but besides being a historical document about rhinestone jewelry it is also a current market guide and so has a ‘life span’, at least on the pricing side of it. The research part of it will remain of value. It is clearly a book that is a tool for people who trade in rhinestone jewelry. A well done and professional reference book.